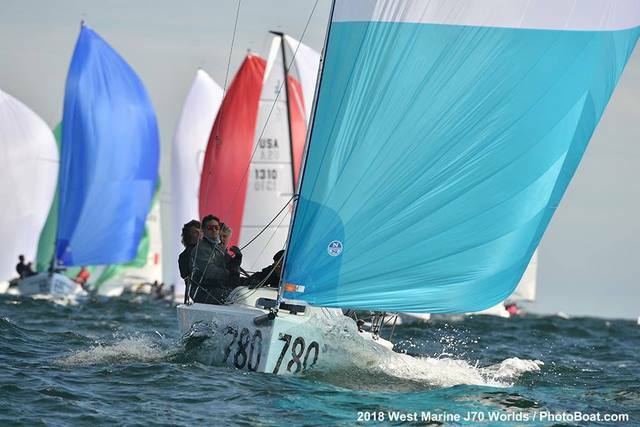 Marblehead, MA (September 25, 2018) – The first day of the West Marine J/70 World Championship will be remembered for tough racing conditions for the 91 J/70s competing. A cold and wet southeasterly wind brought true Atlantic conditions to the combat zone. The big factor was the sea state, with waves topping out at over three metres. Upwind J/70s were climbing, then launching off huge waves. The downwind rollercoaster ride was an adrenaline pumping rush, the opening day was extreme, and right on the edge for racing. PRO Hank Stuart and his team kept a close eye on the weather, and just before the bad weather really closed, called a halt to racing after two heart-thumping races. 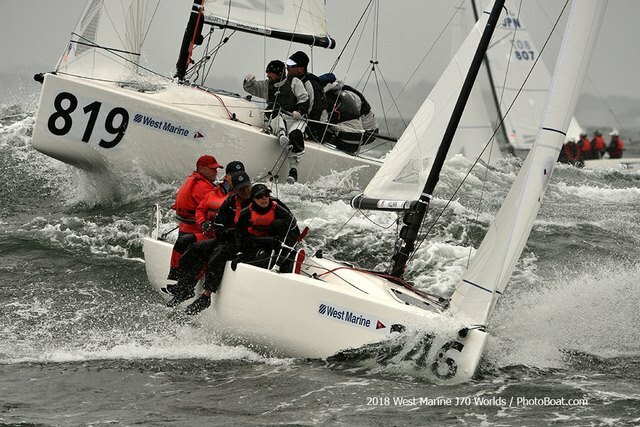 As the fleet headed into a warm welcome at the Eastern Yacht Club, torrential rain engulfed the race area, and there were no complaints about not to running a third race. 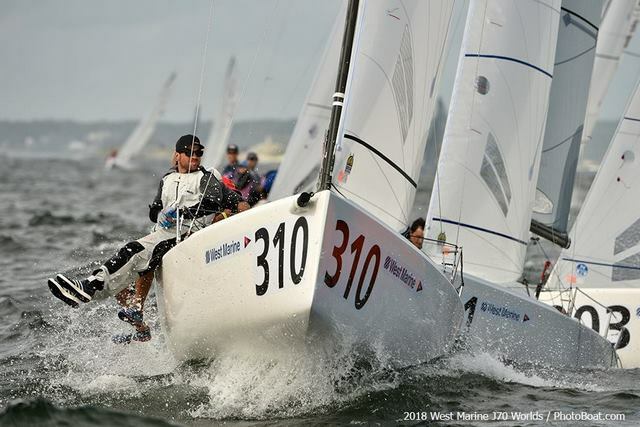 Reigning J/70 Open World Champion, Peter Duncan (USA) racing Relative Obscurity, was second in both races to top the leaderboard. 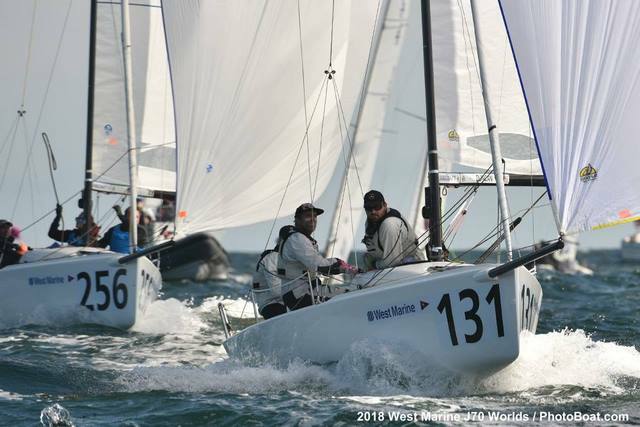 In second place, Claudia Rossi (ITA) racing Petite Terrible scored a 4-1, and lying third after Day One is Bruce Golison (USA) racing Midlife Crisis, after a 3-3 scoreline. Alberto Rossi (ITA) racing Enfant Terrible is fourth after two races, having scored a 5-5, and Vincenzo Onorato’s Mascalzone Latino, racing under the burgee of the Yacht Club de Monaco, scored a win and a 13th to finish the the day in fifth. In the Corinthian Class Jim Cunningham (USA) racing Lifted leads the fleet after two races. 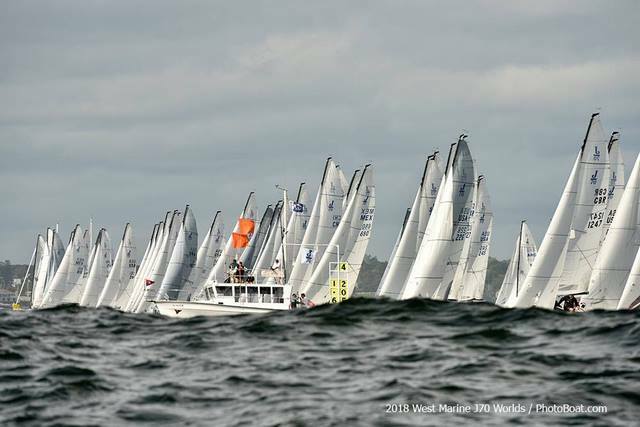 Ignacio Perez (MEX) racing Zaguero with all family members is second, and Lucas Authier (ARG) racing Manuto is third. Luis Bugallo (ESP) racing Marnatura scored the best result in Race One, but retired in Race Two after sustaining damage. Golison is one of the most experienced skippers at the championship, and is a past winner of the Etchells Worlds and J/24 North Americans. “Well done to the race committee today, under pressure, Hank and his team did a stellar job. On the first day of the worlds you just want to have a couple of keeper races, and things worked out for us,” noted Golison. 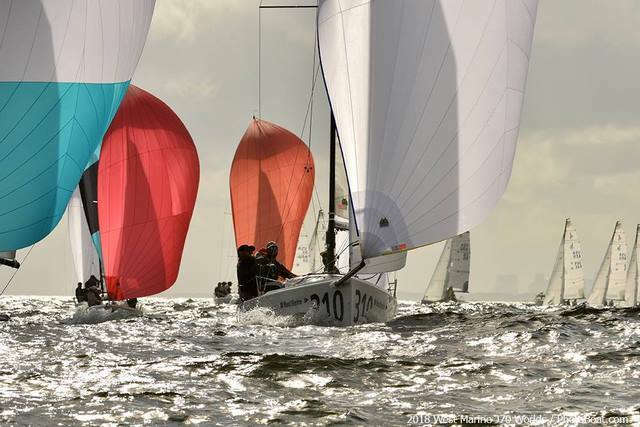 “It is a pretty darn tough fleet, so we are very happy with the start to the regatta. 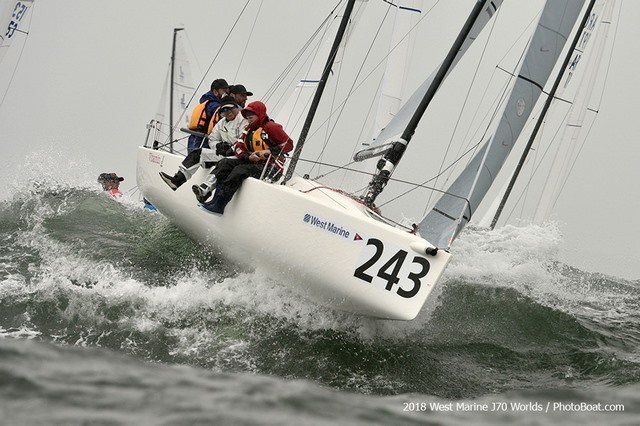 Racing for the 2018 West Marine J/70 World Championship continues tomorrow, Wednesday September 26 with racing scheduled to start at 1100 local time. Fourteen races are planned from September 25 to 29. 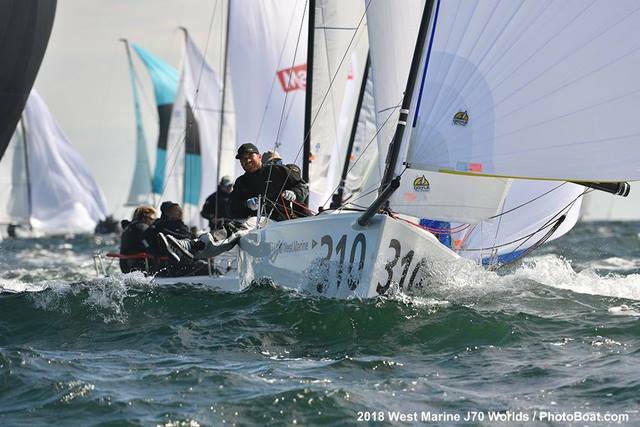 After the rollercoaster ride on the first day of the West Marine J/70 World Championship, a change in the conditions provided a tactical and strategic second day of action for the 91 teams racing for the J/70 World Championship. 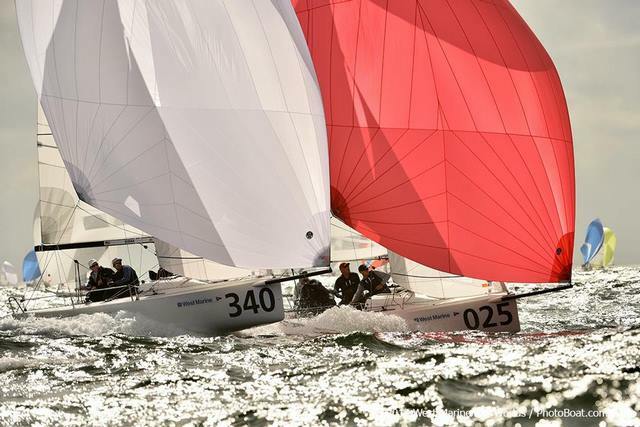 Two Spanish teams reveled in the Mediterranean conditions and are now leading the Open and Corinthian Classes. The wind was oscillating 15 degrees either side of the course axis, and the wind speed varied from 14-17 knots. It was definitely a day for keeping your head out of the boat, anticipating the changes in the conditions. After being deep in the fleet in Race 3, Jose Maria Torcida (ESP), racing Noticia, clawed back through the fleet to finish 14th. The Spanish team followed that with a 2-1 in the last two races to take the lead for the Championship. “We are very happy!” smiled Noticia skipper Jose Maria Torcida. 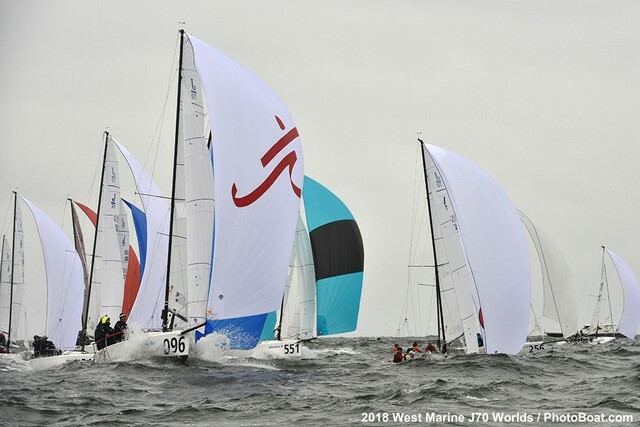 “Today we recovered from the back of the fleet in the first race to fight back up to 14th. Basically, we got the wrong side of the shift in that race. We got the tactics right in the second race, rounded the top mark in second and nearly won the race, but Savasana made a good move on the downwind to pass us. In the Corinthian Class, Luis Bugallo (ESP), racing Marnatura, leads after scoring three good results Wednesday. It was a much better day for the team from Vigo, Spain. After sustaining damage on the first day and retiring, Marnatura now has a big lead in the Corinthian Division. Aldo Centanaro (URU), racing Pura Joda, was the top Corinthian team in the last race, moving the Uruguay team up to second. 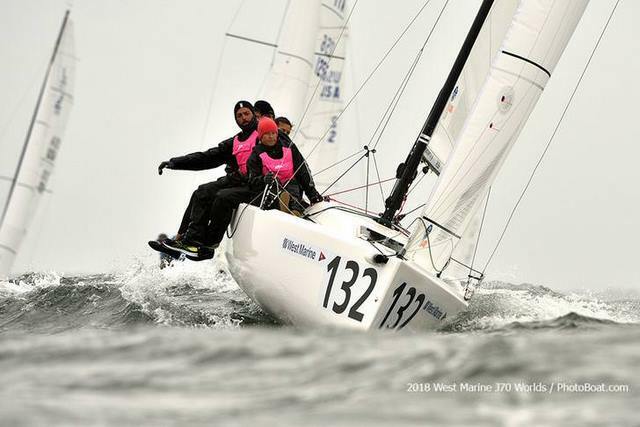 Lucas Authier (ARG), racing Manuto, remains in third for the Corinthian Class. It was not a good day for the overnight leader and reigning World Champion, Peter Duncan (USA) racing Relative Obscurity. “We set up to go left in the first two races, but it did not work out for us,” commented Duncan. “In the last race, we went right and that didn’t work either. Sometimes that happens, but we are only two days into the regatta and there is plenty more racing to come. 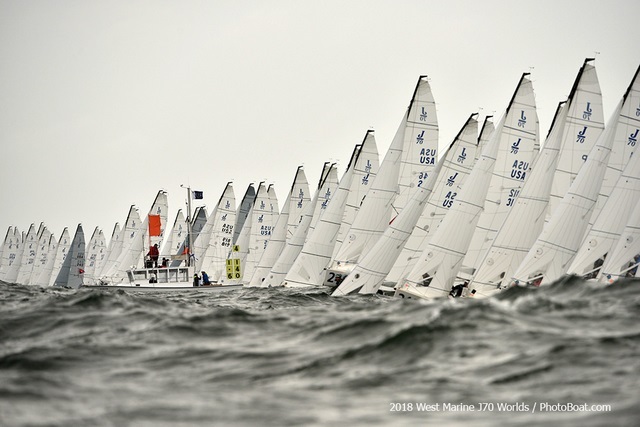 For daily news, pictures and videos: www.j70worlds2018.com. 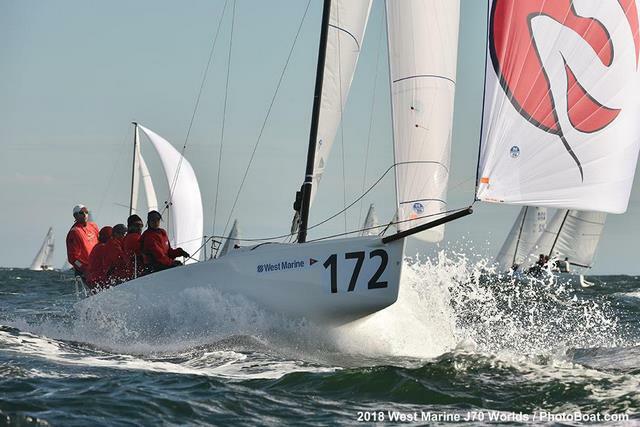 (Marblehead, USA, September 27, 2018) – There were thrills and spills on the third day of the West Marine J/70 World Championships with 15 teams falling foul of the Black Flag during the three races held. 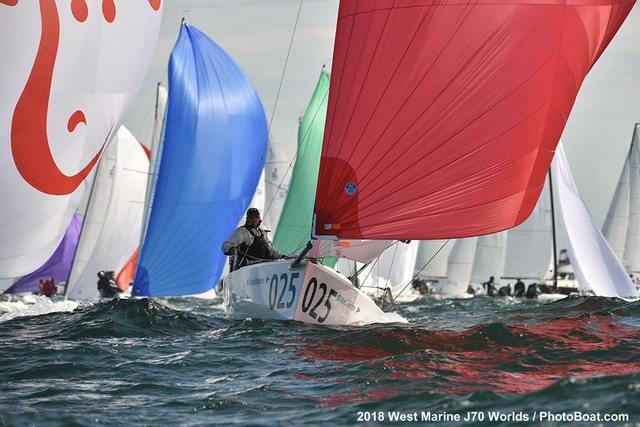 Flatter seas and a shifting nor-easterly provided yet another different day for the 91 teams racing for the J/70 World Championships. 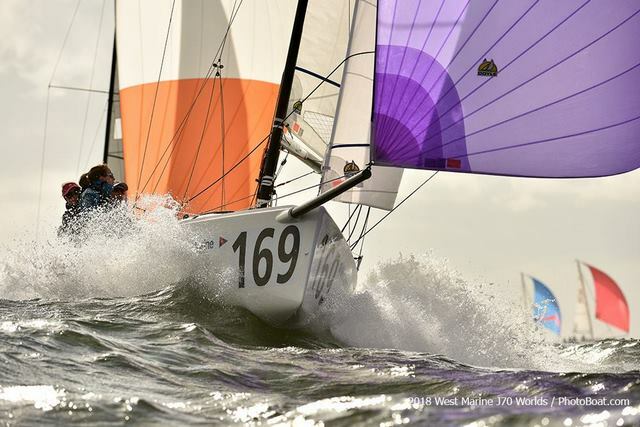 Eight of the maximum 14 races have now been sailed, and challengers for the championship are now emerging. It was a day of high and lows for Peter Duncan (USA) racing Relative Obscurity. 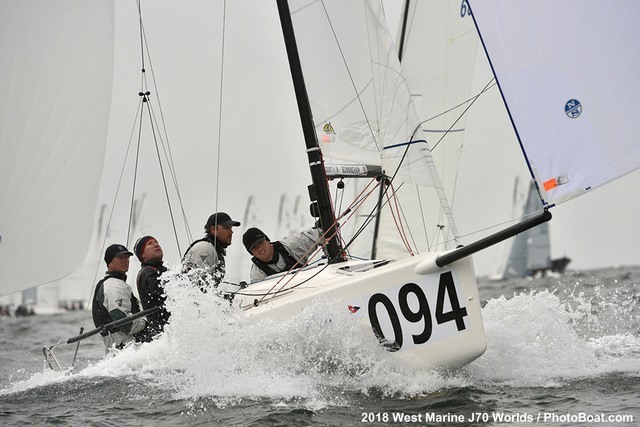 The defending J/70 World Champion did the business in Race 6, scoring their first bullet of the regatta but was disqualified in Race 7 for being OCS with the Black Flag flying. 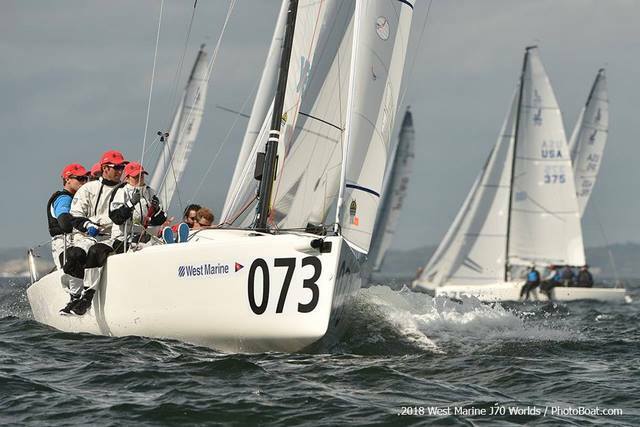 Race 8, Duncan's team scored a fourth to finish the day at the top of the rankings, on countback from Jud Smith (USA). 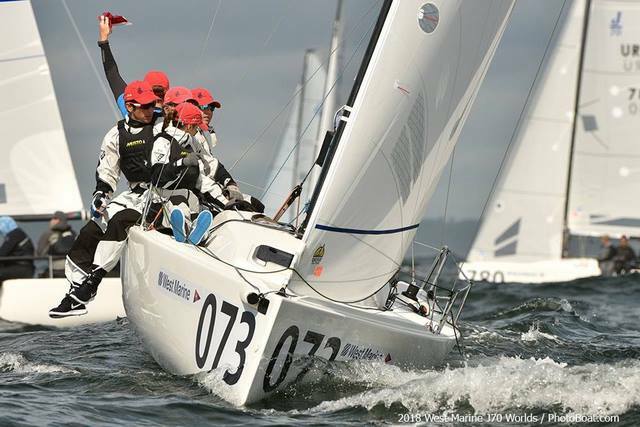 Jose Maria Torcida (ESP) was leading the regatta at the start of the day but a 7-43-31 drops the Spanish team to third. Bruno Pasquinelli (USA) racing Stampede is in fourth place just four points off the lead. Jack Franco racing 3 Ball JT scored a bullet today to move up to fifth. Brian Keane (USA) racing Savasana drops to sixth after a 18-17-26. Congratulations should also go to Gannon Troutman (USA) racing Pied Piper who won the last race of the day. In the Corinthian Class Luis Bugallo (ESP) Marnatura has extended their lead with two solid results today, the young team from Vigo, Spain have now broken into the top ten for entire fleet. Finishing the day in style, Aldo Centanaro (URU) racing Pura Joda, scored a fifth keeping the the Uruguay team firmly in second place. Jim Cunningham (USA) racing Lifted had a consistent day, keeping out of trouble to move up to third. 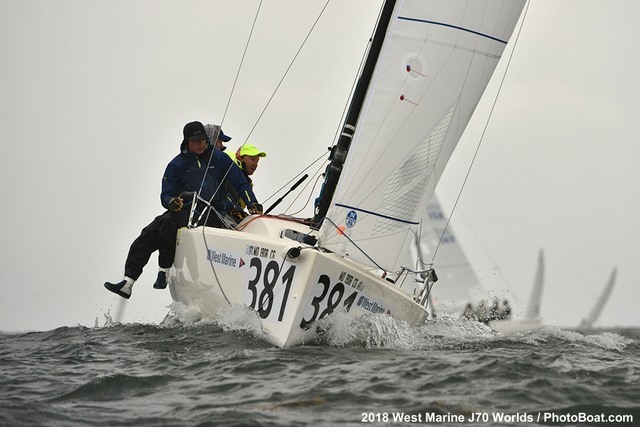 Racing for the 2018 West Marine J/70 World Championship continues Friday September 28 with racing scheduled to start at 1100 local time. 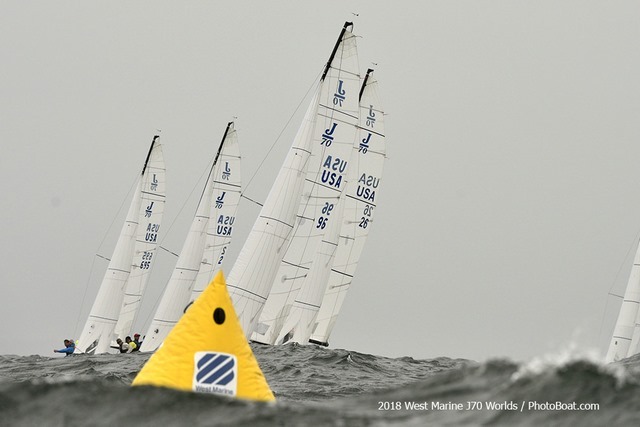 The glitterati from the world of sailing came to Marblehead for the 2018 West Marine J/70 World Championships. Ninety-One teams from 18 different countries battled out 11 highly competitive races. The depth of talent in the fleet was unprecedented with Olympic Gold Medallist, America's Cup winners, and world champions vying for one of the biggest world championship is the modern era. 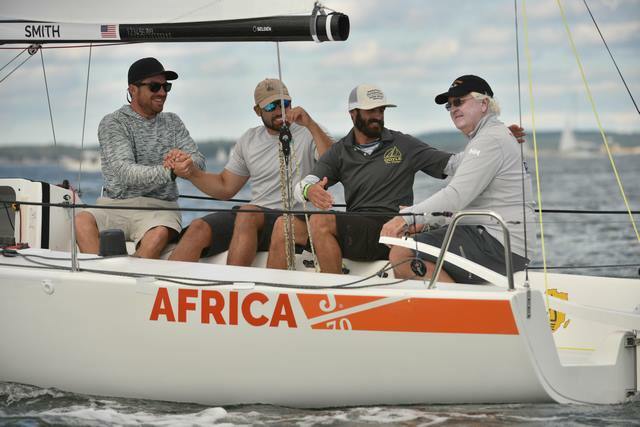 There was a fairy tale ending for Jud Smith, born and bred in Marblehead, winning the J/70 World Championship with his team racing J/70 Africa, and representing the Eastern Yacht Club, hosts for the event. The intensity of the battle was such that Jud Smith succeeded without winning a single race, and only making the top three on one occasion. In the end Jud Smith's Africa (Eastern YC) won the world title by a single point. 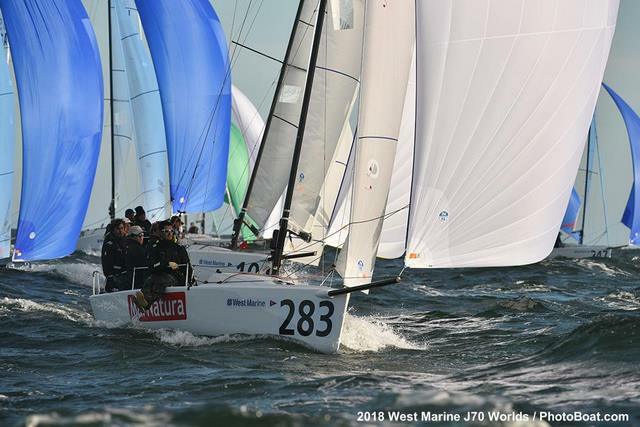 Luis Bugallo (ESP) racing Marnatura is the 2018 Corinthian J/70 World Champion, adding to the European title won in June at the young Spaniard home club, Real Club Náutico de Vigo. Luis like most of the Marnatura team is just 23 years old. Bruno Pasquinelli's Stampede (Fort Worth BC) was the runner up overall, just a single point away from victory. “A lot of the owners have been racing against each other for decades, this has been a lot of fun, even though we just missed out." Of the 11 races sailed, teams from Brazil, Great Britain, Italy, Monaco, Spain, and the United States of America, all scored race wins. 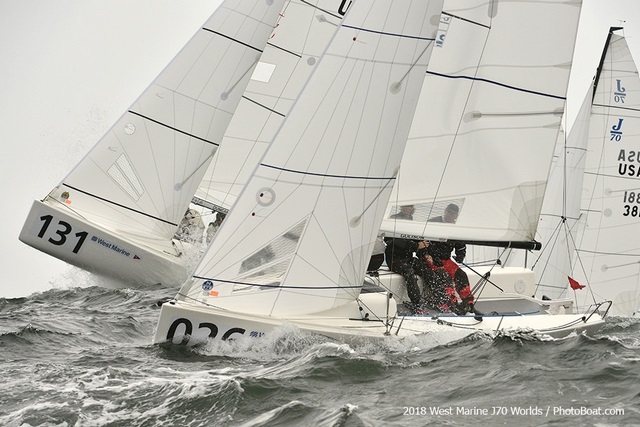 Twenty-Two teams made the race podium, epitomising the strength in depth of the fleet, which was the largest fleet of J/70s ever assembled in North America. 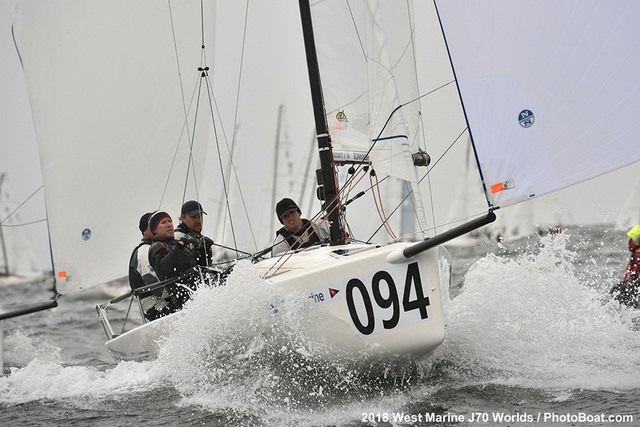 The 2018 West Marine J/70 World Championship Prize Giving was held at the Eastern Yacht Club. 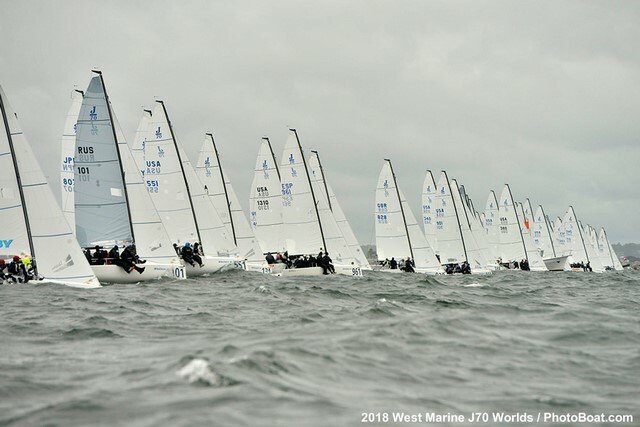 The 2019 J/70 World Championship will be hosted by the Royal Torbay Yacht Club, Torquay, United Kingdom from August 29th to September 6th, 2019. Congrats to Jud & Co, tought fleet and to win it at home by one point, fairy tale stuff indeed!